From the steamy tropics to Australia’s desert heart, Northern Territory is a frontier of extraordinary remoteness where vast tracts are unsettled, climate dominates and our most remarkable landscapes are to be found. 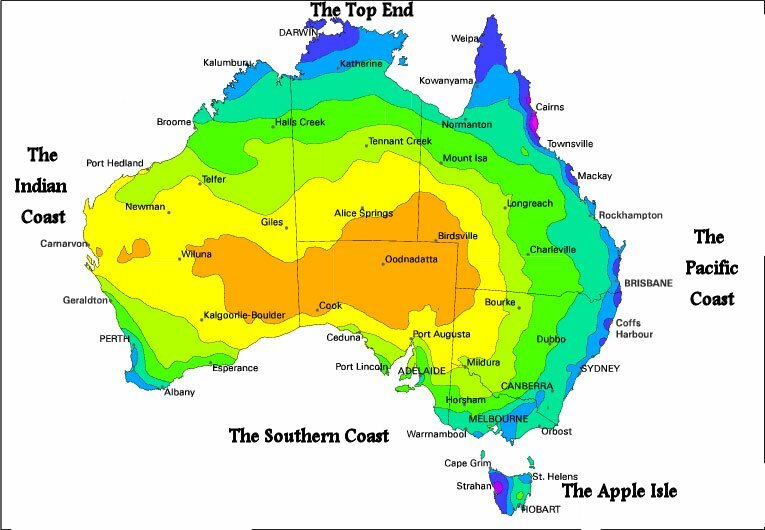 50% of the Territory is Aboriginal land including most of the offshore islands, north east corner of Arnhem Land, a section of the west coast and a piece of the eastern half from Timber Creek to the South Australian border. Darwin is our furtherest outpost. Twice rebuilt it is about the size of a large provincial town. From The Esplanade, Mindil Beach and Fannie Bay you can witness an incomparable sunset. From the modern town of Katherine you travel 320 kilometres north to Darwin on the Stuart Highway. Just 90 kilometres up the track you come to the former mining town of Pine Creek which is at the junction of the Stuart and Kakadu highways. from here you have the choice of either heading on to Darwin or across to Jabiru, the heart of the Kakadu National Park. Should you choose to continue north your first stop will no doubt be Adelaide River. The Adelaide River War Cemetery is a sobering reminder of the impact of World War 2. It is the largest war cemetery in Australia. Adelaide River pub serves good old fish and chips (Barramundi of course!). Batchelor is at the entrance to Litchfield National Park and it is here that you can also see six metre crocodiles jump right next to the boat at Jumping Crocodile Cruises, the Coomalie Cultural Centre as well as the Butterfly and Bird Farm. Should you choose to go to Darwin via Kakadu then you will head north east to Jabiru where you will find a myriad of tours available to help you make the most of Kakadu’s postcard-perfect wetlands, savannah woodland and monsoon forest. Covering 19,000 square kilometres, World Heritage listed Kakadu is the largest national park in Australia and one of the largest in the world. There’s a range of accommodation options from camping to pampering. If you want to venture into Arnhem Land you will need a permit. Arnhem land covers 91,000 square kilometres and is one of the great untamed areas in the world. Its small population is predominantly aboriginal. If you’re here during the Dry season (May to October) you could go on to the Cobourg Peninsula. Cobourg Peninsula lies within the Aboriginal owned Garig Gunak Barlu National Park and is adjacent to Cobourg Marine Park. It is approximately 570 km (by road) north east of Darwin or a 50 minute flight in a light aircraft or 150 nautical miles from Darwin. Stark red cliffs, white sandy beaches, wetlands and clear tropical waters. Fish are as abundant as the people are sparse. North West Arnhem Land adjoins the World Heritage listed Kakadu National Park. Eventually you will make it into the lively harbour city of Darwin. Most people visit in the Dry season but the Tropical Summer has its advantages. In the dry outdoor markets such as Parap, Mindil Beach, Nightcliff and Rapid Creek thrive – Market Picture Gallery. There’s lots of things to see and do in Darwin. Feed the fish at Aquascene, learn about B52 Bombers at the Aviation Heritage Centre, see and hear about Cyclone Tracy at the Museum and Art Gallery, purchase Aboriginal art from any of the many Galleries. And don’t miss a cruise on the harbour – whether by catamaran, sailing boat or cruise vessel.